When making metadata properties available in a dialog box, it can be beneficial for the end user when properties that are related to a particular workflow are grouped together in their own tab. This reduces the length of the list of properties that are shown, thereby making it easier to scan and find the available properties. Figure: A Properties dialog box for a Dossier showing 2 tabs: a 'General' tab containing the general Enterprise Workflow properties (left) and a 'DPS' tab showing all properties that are specific to an Adobe DPS workflow. Step 2. Click the name of the property that you want to add to a group. 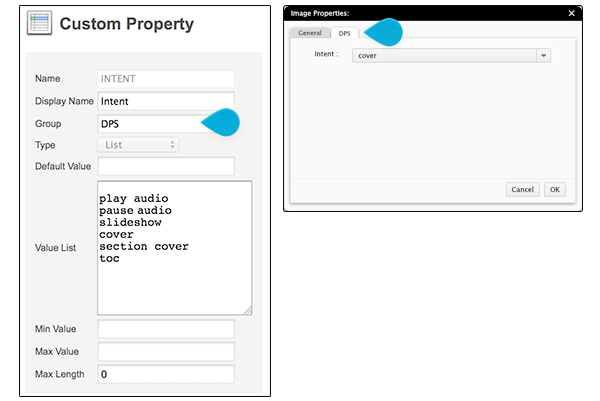 Note: This should be a Dynamic property, XMP property or a custom property; static properties cannot be grouped. Step 3. In the Group field, enter the name of the tab in which the properties should appear (such as DPS in the screenshots above). Figure: Adding 'DPS' to the Group field of a property makes sure that it appears in a separate tab named 'DPS'. 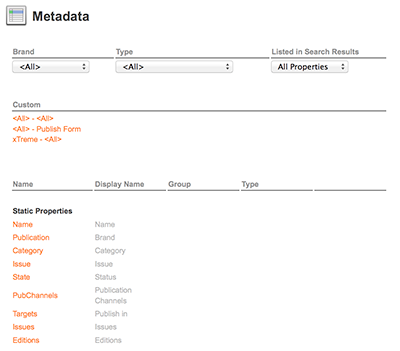 You are returned to the Metadata Maintenance page. Step 5. Repeat steps 2 to 4 to group together as many properties as needed.